My thunderburt snakeskin had a pretty big puncture on the tread on the first ride(ouch), sealant sealed it for the ride, but pretty much 8oz were "used". Patched it myself and I have not suffered any more punctures I even used it without sealant on one ride and held air perfectly fine. Still, while I love how fast and light it is I don't think it is very reliable. In my experience a Racing ralph seems to be twice as reliable. You have all successfully talked me out of Schwalbe. Picked up some recons to try for rear tires and an aspen for when it gets dry an fast. I've been torn between an Ardent Race and Rekon for a rear tire during early season (i.e. still some wet). I think the Rekon may actually roll faster. Think I'll use the Rekon Race once it gets dry. What are you using as a front tire? Got out for a quick 20 miles on the Racing Ray/Ralph combo this evening. After the talk of sub-par casing strength, I’m sorry to say that I freaking loved them. Better in both rolling and cornering than any Maxxis combo I’ve tried. I’ll probably use these for training rides and see if I can kill ‘em, and they seem like great short track racers at the very least. Yep drewbird i agree they handle impressively. Its been pretty damp here and I have been using an Ardent Race. It's god awful. I have the same experience with the ardent race. Any dampness and its no good. If its wet, forget about it. It also rolls a little more slowly than its peers. They're great race day tires. They grip very well, roll well, and wear super fast. They're not your everyday training tires that you can still race on. If you ever decide to get them don't try any without snakeskin. I cut a sidewall on a gravel road, no joke. I'd run Schwalbes if they sent me a new set every race. Since I still pay for my tires I'll stick to other brands. I looked at the Thunder Burt sitting on my bike right now, corrner knobs are starting to peel and middle knobs are approaching holographic status. Maybe 500 training miles on em (which is actually a record for me and Schwalbes). I've had much better luck with the Addix compounds on trail/AM tires. The older Trailstar-type compounds were awful, I swear I wore out a pair of Magic Marys in a weekend of gravity riding. But the newer Addix has been much better for me so far. We'll see how the Ray/Ralph combo wears. Exactly, i get about 300 out of my snakeskin raplh on the rear. Like you, i dont get them for free so i need something that is durable, gripping, and longer lasting. Agree 100% with your posts about the Ray/Ralph. Simply the best combo I've tried. Compared to snakeskins, I find the new addix compound far superior. I've heard a few pops on the ray/ralph combo where I was ready to get off and start slinging tools, but … not a single puncture yet. They are tough. For the weight, I don't think this combo can be beat. Compared to snakeskins, I find the new addix compound far superior. I've only run the snakeskins though I do have an Addix Ralph to throw on the training bike next. I'm interested to see if/how they've improved with this new red/blue/green/purple striped compound, just not interested enough to shell out any (more) money. For clarity I'll mention that "Snakeskin" is the puncture protection stuff in the casing (Exo/TNT equivalent), Addix is the rubber. Schwalbe has been using "snakeskin" as their light casing reinforcement for years, though the claim to have recently improved it. Addix rubber replaces the old Trailstar/Pacestar compounds, and is identifiable as the tires with a blue or red stripe down the tread. My experience with old non-Addix tires, (mainly Trailstar rubber w Snakeskin casing) was that they wore quickly and punctured pretty easily. I'm now trying the Addix/Snakeskin Ray/Ralph combo, and love the handling. We'll see how they hold up in terms of both punctures and tread wear. I'm no whippet at 6'3" & ~190lbs, but hoping appropriate pressure and the fact they're on a FS bike (Sniper XC) will keep them intact. I've never tried a non-Snakeskin Schwalbe tire of any kind. Given how thin the Snakeskin casing is I assume those would just pop like balloons at first contact with loamy soil. Ill have to try the new compound then. Thanks for the update. That sounds promising. Haven't run Schwalbes since prior to the new Addix compound due to reliability issues. Looks like those issues remain in place. Seen too many Schwalbe DNF's to trust them. I've got some NIB Schwalbes from swag/prize packs that I'm using up on the training bike and they're great in many ways, I just don't trust em. +1 on that. Love the way they feel, way too many punctures. Cost me dearly in a handful of races. Any recommendation for super technical East Coast endurance racing on a hardtail?Preferably Maxxis. I'm thinking Ikon 2.35 front and rear but I'm tempted to try the Aspen or Rekon Race in the rear. If the surface isn't too loose then that'll work well. I decided to experiment a little before the first race of the season. I am on a rigid SS this year and was looking for some extra cushion in my tires without sacrificing too much in speed. Being the Vittoria fanboy that I am, I pulled the trigger on 2 of the 29x2.6 Mezcals with the XC-Trail casing. Hopefully these feel as fast as the 2.35 Mezcals I ran before, and the new XC-Trail casing holds up to the sharp limestone where I am at. I've been running a 29X2.6 Rekon up front with a 2.6 Ikon in the rear for the last mi th and it's been a solid set up. I'm going to lighten the load for the first race of the season though. Geoff Kabush raced, and won, the 2019 Moab Rocks Stage race on Rekon Race front and rear. He was running them on Crest CB7 rims w/ 23mm internals at 20.5 - 22.5 psi. Probably not a great choice for everywhere but obviously worked fine for those conditions. In an article on Pinkbike he said that he chose the tires because in Moab you don't need knobby tires, you just need good compound, so he chose 2.35 Rekon Race front and rear, because it is a very fast tire and has a big volume in 2.35. I decided my worn down XR2s needed replacing two days before my season opener. I had a like new Ikon 2.2 EXO for the rear. 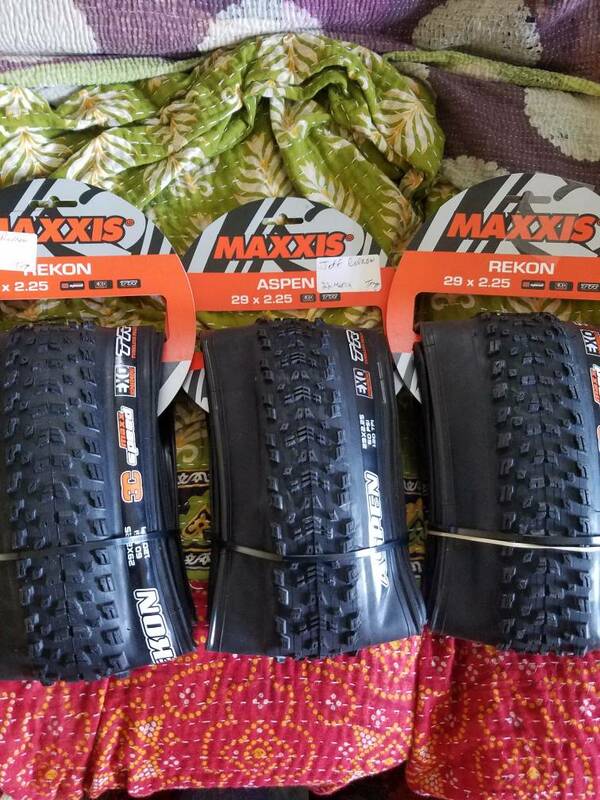 I really wanted to try a Rekon 2.25 front but the only XC tire I could find in stock locally was another Ikon 2.2 EXO, it should be fun to see how this setup does on the buff trails I'm racing this weekend, it's been a few years since I ran them front and rear. I've got a Rekon/Aspen 2.25 setup on the way to try later this summer. I like that setup. Ive done almost all of my training miles this yesr on it. They will drift some in leaf litter but theyre very predictable. for something different this year on my hardtail I put an Ardent 2.4 front, and Ardent Race 2.35 rear, I use the hardtail when it's wet. 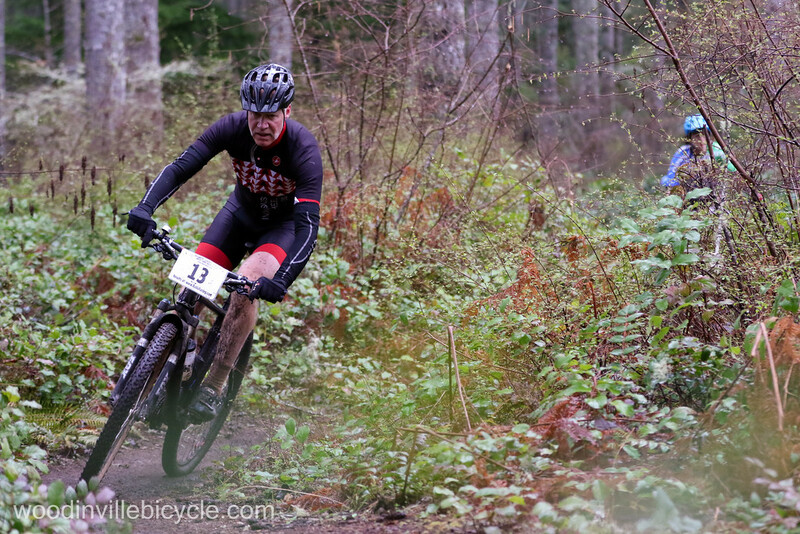 A couple of weeks ago we had a snowy/muddy race, I don't recall hating that combo, but I did not feel very confident so maybe it was the tires and not just the nasty trail conditions. It looks like it will be wet for tomorrows race (final race of the early season series), but the course has a lot of small round rock/gravel/sand (glacial till type dirt iirc) and drains exceptionally well, so I should be ok.
Vittoria seems to be working with a lot of the small amateur teams, I'm seeing lots of Barzos around at the races. I've been really loving the Mezcals on my fs bike (I moved the Barzos I ran last year on the hardtail onto my kids bike), they roll super smooth/quiet/fast on hardpack, very predictable and solid cornering grip. I think I will bug our team/shop guy about getting us on the Vittoria deal some more, I think I'd like to put Barzos back on the hardtail for wet, keeping Mezcals on the fs for dry. Race day tomorrow and we will get about 2+ inches of rain and racing limestone rock gardens and a clay/limestone mix. It will probably be raining during the race as well. Running forekaster/forekaster 2.35 Exo on both race bikes. I had a Forekaster dual in 2.35 it wore out in like 6 weeks. I am curious what others experience is with that tires longevity. How many miles did you do in 6 weeks? That seems super fast compared to my experience with maxxis tires. The Forekaster was designed for wet conditions. However, it works really well in hot and dry conditions but it does not last in those conditions. Haven't tried them yet but I think the 2.4 Recon would be an amazing tire for the hot, dry and loose. So many great tires these days. I no longer race, but I love trying different tires. I just got in my first ride yesterday after a long winter off the bike. Though I'm ridiculously out of shape, I was stunned by how fast my new set of Mezcal 29x2.35 (730g each) rolled, and how well they gripped. Southeast Michigan trail, mildly loose, sandy hard-ish pack with a layer of dry leaves over 75% of the trail. Top Fuel, 23mm inner rims (I think), pressures at 22f and 25 rear; I'm 160ish. The tires rolled so well I felt like I was a month or two into the riding season. It was weird. Though they aren't DHFs, I hit some turns pretty hard and they stuck like glue. I didn't encounter any steep, technical climbs nor did I have any panic stops so I can't judge driving /stopping traction. I will try pushing them harder today, to get a better sense of their limits and precision. If I still raced I would seriously consider the Mezcal, despite their weight. I ended up flatting the Ikon rear. I haven’t flatted in years and it was a relatively smooth but fast course. I need to do an inspection today but I expect it was a hole in the bead. I run them in hot and dry conditions with the occasional wet. I have normal Maxxis high mileage out of them. Fronts loose barely any of the sipes on the center over 1500 miles. The rear will wear through the knob on the center and have no more sipe while the outer ones stay. There is still tons of traction because the knobs are so tall. I would say they have 2-3 the life of a rocket ron or Ralph, similar to a nobby nic. Cut sidewall on the front Fast Trak for me yesterday. Very odd as I am not even sure what I cut it on! Oh well. I saw 4 people with flats, so I am not going to get upset about it. Thanks for the update on the new Sworks casing. I used to love the old (pre 2016) Sworks Fast Traks but the thin sidewalls cost me a race or two. Some races are just flat prone though, is what it is. Once it becomes a pattern then I make changes. I have one in the front that just started third season. Might need a change in the middle of season though. Very few sharp rocks on the trails. Ardent front Ardent Race rear were quite good yesterday racing in damp/wet with just a little mud and quite a bit of 'marbles'. I did lean them over a lot further on the hard inside/flat of a berm (not this photo) than I had intended, and I was very pleased that they hung on really great. I am not writing it off yet. I have not done anything I would consider treacherous yet; just the one rock garden (on this course, with 3 races on this course) and I cut in an odd spot. I am going to try and see what the others were running for tires. My friend flatted last round on this course on a Maxxis, so the only pattern so far is the course...so far. I definitely want to figure that out before I get to the bad courses! Yeah, it's a great front due to the tall knobs, but I don't see it as a great rear. I talked to a guy walking after the first rock section after the initial climb to the pond...not even a bad rock section but it tore his racing Ralph sidewall too bad to repair. It didn’t seem like a terribly rough course to me but like you mentioned, there were a lot of crashes and repairs going on. A C1 friend flatted on lap 1 with Snakeskin Thunderburts in the tread. I put an old RaRa 2.25 I had to get me through Sea Otter. The Fast Trak was SUPER thin on the sidewall where it tore. So I will consider saving those tires for special events in the future. I've actually had good luck with Schwalbe, so I might try the new RaRa combo soon. I want to try and avoid weak tires for Big Bear while hopefully avoiding too heavy with the Grizzly100. I cut somewhere on the grassy descent area after the road climb. Seems weird, there are no rocks there. You know it is a thin sidewall when you cant find the object that cut it. New xr3 looks great. Xr2 center, xr4 side knobs. Like a more aggressive fast track. I was out for a rip on my xr1s. Not sure if they have a stiffer sidewall then the xr2 but man i love these tires on dry. Hit any type of mud and they are absolutely useless tho. I have both Rekon Race 2.25 and 2.35. I can't call 2.35 a big volume. It's more like 2.3 on a 27mm rim and only slightly wider than 2.25. In comparison, Ardent Race 2.35 is practically 2.4 on the same rim. Maxis Ikons 2.2 EXO still rock, 600g or less, super durable.